On December 29, 10 days in James Cameron’s sci-fi epic Avatar’s run at the box office, I went out on a limb and wrote a post entitled Avatar Will Surpass Titanic as the #1 US Domestic Box Office Hit in History. At first I received quite a few flaming hoots of derision on various box office discussion boards, but during the intervening 14 days since I wrote that post, Avatar has rapidly climbed the charts and now stands at $429m domestically, leaving it $171m shy of Titanic’s all time domestic gross record of $600m–and the number of scornful comments has slowed down considerably. Globally, Avatar has moved into the number two spot behind Titanic and appears likely to surpass Titanic on a worldwide basis as well. So, having gotten this far and with this much data in and trends established, I am going to ‘double down’ and predict not only that Avatar will not only surpass Titanic — I’ll take a whack at predicting when it will happen. My prediction: February 11th, and in any event not later than Valentine’s Day Weekend. Avatar got off to an $18m lead on its first day in release, beating Titanic $26m to $8m, and has been adding to that “lead” every day. 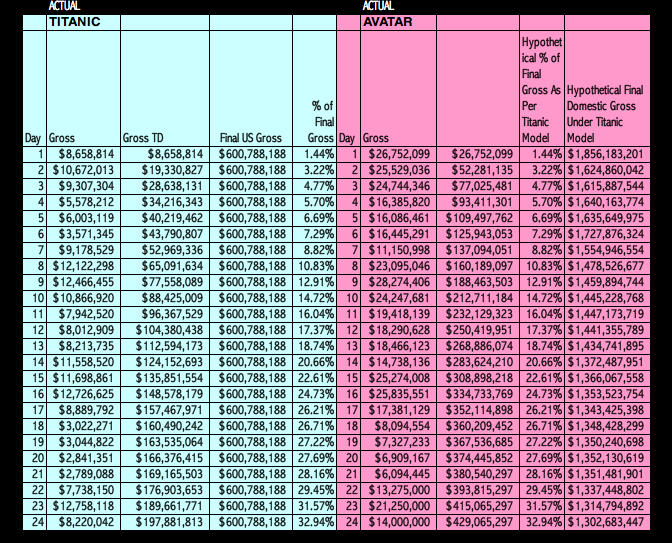 After 21 days in release, Avatar is at 380m domestically compared to $169m domestically for Titanic through 21 days — a lead of $211m. Now, finally, is the prediction chart — which takes the chart above and extends it on a ‘go forward’ basis, making what I believe are rational predictions about Avatar’s daily box office in the coming weeks, taking into account the trends and patterns that have been established thus far, plus some assumptions about competition that will be coming out in coming weeks. The chart shows Avatar catching Titanic on Day 56 — February 11. As study of the chart will show, the trends day/day, and week/week, as well as Avatar/Titanic are all fairly reasonable and consistent with what has been established thus far. If you look at the far right column and see the trend showing that the final predicted gross of Avatar is dropping — this is basically a reflection of the fact that under the model presented above, Avatar has legs, but its legs aren’t as good as Titanic–hence the diminution in its projected final gross based upon the numbers imputed for its daily gross going forward. It’s not quite keeping up with Titanic — but it’s lead is so great that this doesn’t keep it from catching Titanic. Is this how it will really play out? Of course no one can be sure. But I’ve been right about it up until now. I think it will perform generally in the manner indicated above — and am pretty confident that pretty soon whe question “Will Avatar beat Titanic?” will be replaced by “When Will Avatar Beat Titanic”, which will then be replaced by “Adjusted for Ticket Inflation, Will Avatar Beat Titanic?”. For convenience for anyone who’s interested — following is the original post on Dec 28 that started this discussion. Weekend Box Office figures are in and Avatar only dropped off 3% which means Cameron’s film has phenomenal word of mouth as well as the ability to draw viewers back for second and third viewings. Considering that the average dropoff for a blockbuster is around 40%, this bodes extremely well for the longterm prospects and in fact it’s now possible to start trying to figure out just where Avatar will end up. I’m going to go out on a limb and say that I believe, based on analysis of the first 10 days and first two weekends,that Avatar will not only exceed Titanic’s record of $600,000,000 — I believe it will be the first film to generate domestic Box Office Gross of $1 Billion. Here’s why. 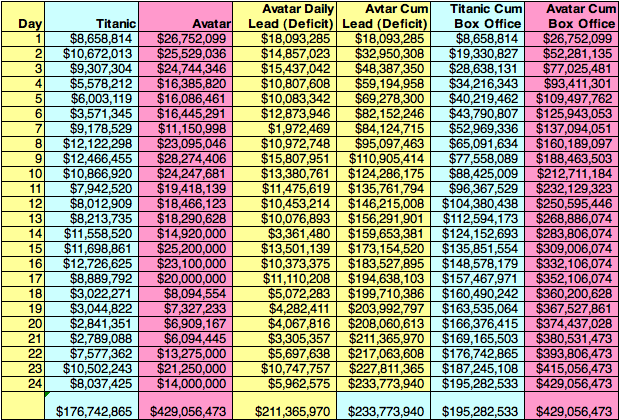 The following chart looks at the first 10 daily grosses for Avatar side by side with the first 10 daily grosses for Titanic and Dark Knight, the #2 all time hit with $533M. Another thing to look at is the first two weekends and compare that to both Titanic and Dark Knight. 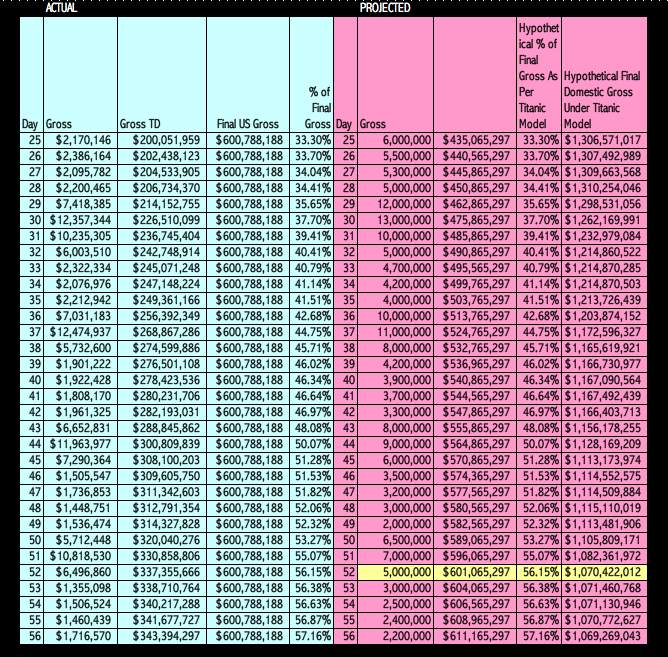 Note that the official estimates as of Sunday morning were that Avatar would end up at $75,000,000 but I’m pretty sure it will exceed estimates when the final numbers come in, just as it did last weekend when it was initially reported to have earned $73M, then upgraded to $77M when final numbers came in. So — worst case — Avatar dropped 3% and Titanic grew 26% in its second weekend. But look at Dark Knight — off almost half in its second frame, much more in line with industry norms. So although Avatar is not quite keeping pace with Titanic’s weekend to weekend trend — it is way ahead of Dark Knight and other recent mega blockbusters such as Pirates of the Carribbean: Dead Man’s Chest which opened at $135M for its first weekend, then dropped 54% to $62m in its second weekend en route to a total of $423m. Anyway — my final word on this is that Avatar is almost 100% certain to surpass Titanic, and I’d give it at least a 50-50 chance of making it to $1B in domestic box office. ~ by Michael Sellers on January 9, 2010. Hello, my name is Chris. Just wanted to let everyone know that I opened my new blog recently and that I would love everyone to visit!